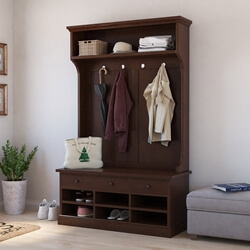 Home entryways are often the most overlooked part of a furnishing venture, but Sierra Living Concepts’ Hall Tree Collection will make you want to up your own. Whether you live in a humble abode or a large villa, we’ve got a variety of options for you to choose from. 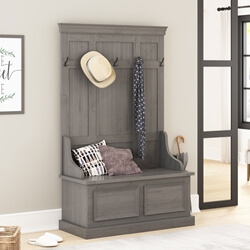 The concept behind our hall tree designs is to provide an ease-of-use along with an attractive aesthetic. 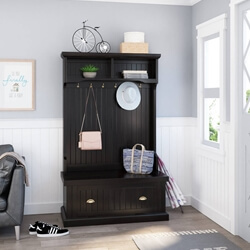 The basic design of all the hall trees in our collection have a top part for décor, a middle portion with hooks, and a bottom half with closed storage. 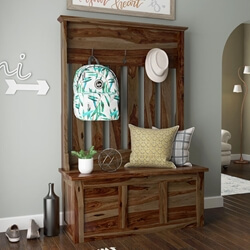 Even with such strict parameters, each hall tree in our directory manages to emulate a beautiful distinctness that you can customize with your own ideas as well. 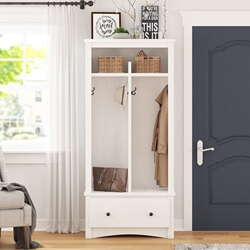 Our creative team and collaborative tools allow our customers to input their personalized details in any existing design, shade, size or finish, to make it suit more to their own needs. 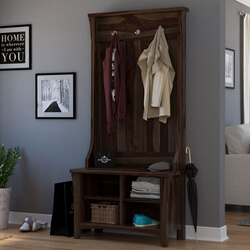 Furthermore, every hall tree designed by Sierra Living Concepts is made from the sturdiest solid wood. This not only ensures an excellent heirloom quality but also boasts an old-world craftsmanship carried out by skilled artisans. 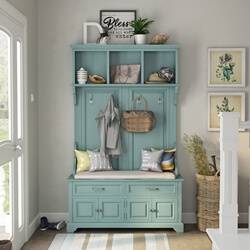 Each joint, nook, and cranny is enjoined by hand – something you can never find in mass-produced furniture these days. Our hall trees also boast a diverse visual range and you can easily find one that suits your home aesthetic perfectly. From traditional to rustic, minimalist, modern, and industrial, we’ve got every style that suits contemporary tastes. 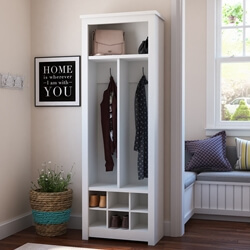 They also vary a lot in size, so it doesn’t matter whether you’re searching for one to furnish your small-style or luxurious homes – you can find everything in our collection. 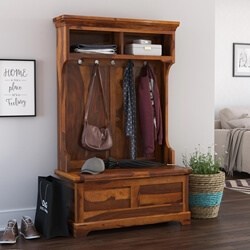 With Sierra’s Solid Wood Hall Trees, you can breathe a whole new life into your empty hallways, foyers, and entrances – it’s definitely the crown jewel among all entryway furniture.